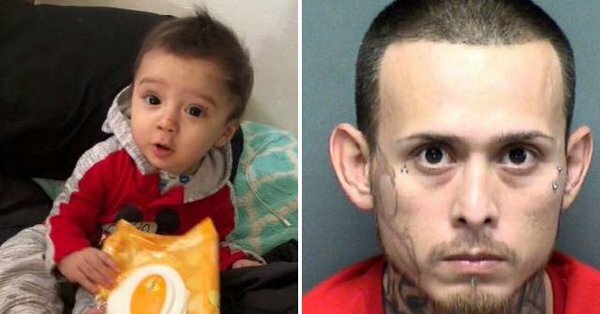 A father killed his eight month-old baby son, then staged a kidnapping to make it look like the little boy had been abducted, police say. Christoper Davila is accused of deliberately injuring the youngster, named King Jay, then roping in his mom and cousin to claim the infant was abducted when his car was stolen from outside a gas station. King’s body was stuffed in a black backpack and buried in a field in San Antonio, Texas, Friday, with Davila reportedly leading cops to the burial site himself. Davila is said to have claimed that King died while he was sat in his car seat, on a bed. The child abuse suspect claims that when he sat down on the bed, King bounced off, hit himself on a dresser and landed face-first on the floor. Davila claims a large bump formed around the child’s eyes, leaving him too scared to call 911, and said that when he checked a few hours later, the baby had died, according to KSAT. He reportedly buried King less than a mile from his home, and has so far been charged with crimes including felony injury to a child as well as evidence tampering. Davila reported King’s abduction last Friday, sparking a huge police search for the little boy. Within 24 hours, officials revealed that they were beginning to doubt whether the youngster had really been abducted, and said that King’s family were refusing to fully cooperate with their investigation. Surveillance footage showing a woman in a gray hoodie ‘stealing the car’ was released, with cops saying her purposeful, hesitation-free stride up towards and into the vehicle suggested a set-up. And his mother, Beatrice Sampayo Davila, 65, was arrested earlier this week over claims she was the one who drove Torres to the gas station. She is said to have told Torres that Davila had told her he’d greviously injured his baby son. Both women face evidence tampering charges. This seems to be the increasingly "Normal" = "usual" thing to do these days. 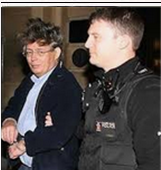 But then I suppose there are few other options if you want to avoid immediate arrest. If you take the money out of your pre-payment gas meter what can you possible say ? You can admit it, OR you can blame it on an someone unknown who must have entered your house illegally. A burglar. If you are found in possession of controlled drugs, what can you possible say ? You can admit it, OR you can say it must have been planted. And since the only other person present is a police officer, blame her. If you sober up from having been impossibly drunk or drugged and having behaved outrageously, what can you possible say ? You can admit it, OR you can blame it on someone unknown who must have 'spiked' your drink. If you hide the body of a person who died, and are then come under suspicion, what can you possible say ? You can admit it, OR you can blame the absence on an someone unknown who must have taken the person away. An Abductor. 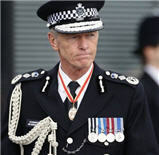 Police officers do not 'blame' them for having a try. But they learn to recognise the pattern. Guilty parents read the dummies guide on how to fake an abduction of your child. They forget that cops also read the same book and also all the revised additions. 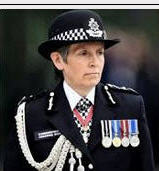 If anything, cops should be able to commit the perfect crime as they know pretty much everything that would trip up the perpetrator, like anythiung though. There is no such thing as a perfect crime. Sooner or later the case gets solved. The mccanns have to trust that no one else in the group will crack. 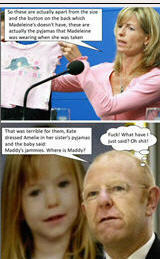 If they hauled just the tapas 7 in, the truth will out and their chums will promptly thrown the mccanns under the bus. 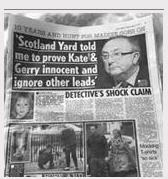 They may have bought the accidental death story from the mccanns, they will not take accessory to murder charges lying down. @Hobs wrote: Guilty parents read the dummies guide on how to fake an abduction of your child.